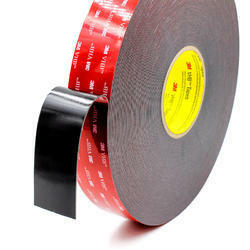 We are offering VHB Tape to our clients. Our company has gained name and fame in presenting Acrylic Foam Tape. Fast and effective bonding solutionsVHB double-sided acrylic foam tapes offer a flexible, durable, versatile and strong bonding option for a multitude of industries and applications. The acrylic closed cell construction of VHB tape helps to seal against moisture and provides long term resistance to UV and temperature cycles. JONSON VHB Tape or High-strength bonding tape is a proven alternative to screws, rivets, welds and other forms of mechanical fasteners. Saksham manufactures VHB tapes to permanently bond and seal many metals, plastics and other surfaces for improving productivity, strength, durability and appearance. 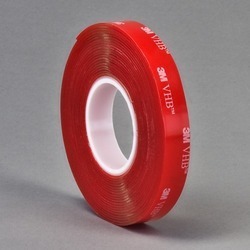 One can avail from us a quality approved assortment of VHB Tape. Owing to their top quality, our products are extremely praised amongst the patrons.